Everybody talks about customer journey maps. Seems that everybody does them. And, admittedly, there’s a million suggestions out there on how to do them. So, on the back of the service design course that we’ve developed, it seems the right time to start describing each tool and method in detail. A how to guide, if you like. This is the first article in, what will probably be a series, and hopefully help someone out there to understand their customers better. The goal of a customer journey map is a better service, not a piece of art or just better understanding of your customer. It is a means to an end, not an end itself and the amount of time you invest into making it sophisticated, well designed, beautiful must be in relation only to making it easier to understand for those that weren’t involved from the beginning. When you google customer journey maps on the internet, some of them are very intimidating because they look …just WOW! The question you should ask yourself, however, is “does it tell me something?” If it doesn’t make sense to you then it probably doesn’t make sense to anyone else either, without a lengthy explanation. So what’s the value of that document? So, consider the customer journey map a two pronged job: one, is to actually understand your customer’s journey from need to satisfaction and two is to ensure that the resulting information is presented in a format, that makes sense on its own. Therefore, it might make sense to work backwards and consider the format first. Who needs to see it, who needs to understand it, who needs to work with it in the future, who has “buy” it and how much time will any of these stakeholders invest into understanding it? To paraphrase Elon Musk, “if a journey map requires a lengthy explanation then it is already broken.” Never forget, that you’re not mapping the customer’s journey for yourself. OK, now that this is out of the way, let’s look at how to actually do this. Or rather, how we do it. For obvious reasons, you can’t just gather a bunch of customer’s in a room and ask them to explain their journey from need to satisfaction. It’s too big a question and mostly incomprehensible. Instead, the best starting point is to guess yourself to a hypothetical customer journey inside your company. Step one in this process is to gather a multi-disciplinary, cross-departmental team and, working with customer personas, imagine what these different customer journeys could be like. The personas (which we’ll cover in another article) are made up customer profiles that people can relate to, that also describe the customer’s need. Working in small groups, you can map the different personas journey from need through transaction to satisfaction. To make it relevant to your business, you have to divide their journey timeline into specific steps. The generic one’s are attract -> choose -> use -> support -> retain. Make the steps specific for your area and describe what the customer is doing, where the customer is doing it and how it feels. The benefit of first mapping the hypothetical journey is that you have access to internal information and data. By working in a multi-disciplinary team, you also get all the insights that different people from across the organisation have on your own business, and what they see as potential problems and opportunities. One of the discoveries is usually, that different people from different departments have completely different views on what is a problem for customer and what isn’t. Gathering observations like this for the whole customer journey, will give you an incredible amount of data. Depending on your business and the length of the customer journey (there’s a difference between choosing a home and choosing chewing gum), you can end up anywhere from dozens of data points to hundreds. The next step, obviously, is to clean up the journey map by digitising it (or rewriting the observations cleanly on paper, if you want / can keep it analogue). The cleaned up version has a range of pain-points and opportunities, at least according to you. This is now a hypothetical journey map. The job is now to validate it. Depending again, on your business and the pain-points you’ve defined you can choose to contact customers and talk to them about their journey. For this, you can use the hypothetical journey as a reference for them to reflect on. It is much easier for them to compare their journey than to imagine from scratch. Also, it allows you to ask follow-up questions on pain points, because you now have much more insight on what the possible problem reasons could be, as a result of the workshop you did with internal stakeholders. If you can, observe customers at different stages of their journey. Observation, of what people have problems with, or why they do things a certain way, is incredibly illuminating. If you can then follow up with conversations, asking them to explain their own behaviour, will deliver very valuable insight. 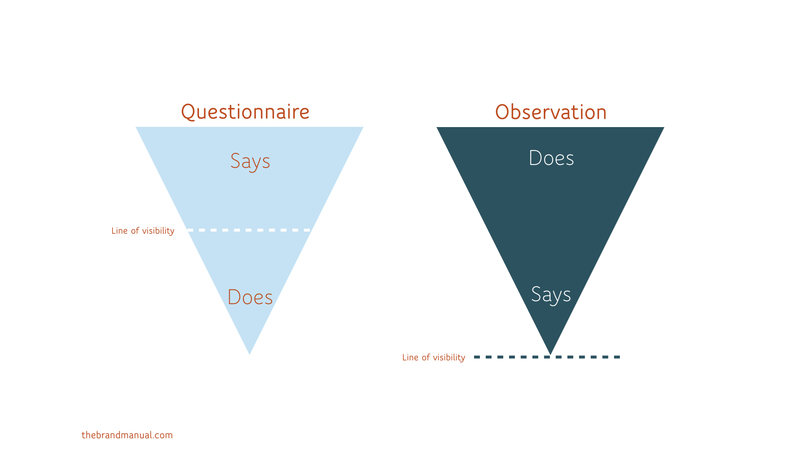 Observation, in fact, is probably the best way to find out how customers actually act, simply because people will lie, when you talk to them. For each touchpoint along the customer journey, validation through observation and interviews will allow you to clearly define opportunities for development and pain points that simply must be fixed. Throughout the process, you’ll also come up with a lot of ideas for potential solutions. Either customers will suggest comparisons to experiences that are better in one or other particular touchpoint, or your team will find associations and inspiration through the process. Either way, the validated customer journey will, once it is clearly documented, demonstrate shortcomings, opportunities as well as suggest ideas that could be used in developing the service. – make it easy to update and change: investing too much effort into a beautiful document will render it static. 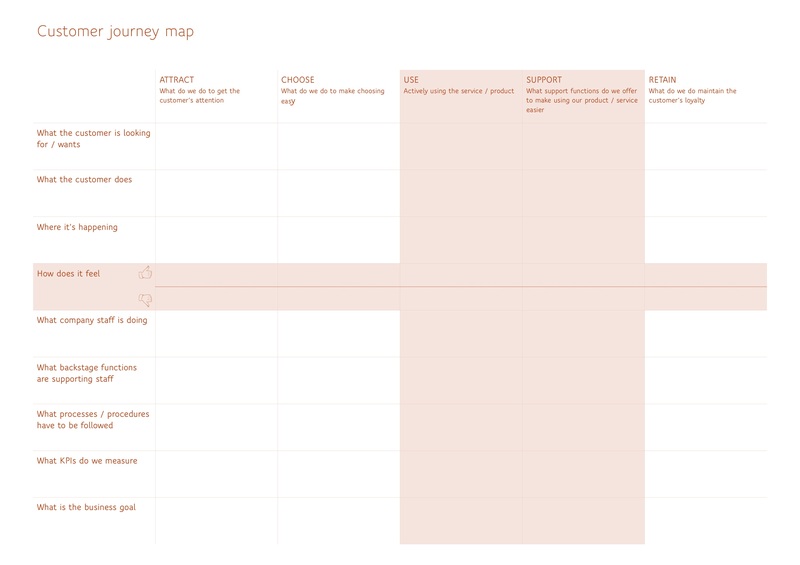 However, a journey map is a tool that becomes the foundation of your service blueprint, your internal touchpoint map and as such has to be easy to use and share and change. Understanding the internal perspective is crucial. Improving the customer experience requires organisational change and being able to draw a straight line between internal processes and negative customer experiences highlights in a very effective manner, the need for change.